1867 $2 1/2 Quarter Eagle, Judd-595, Pollock-659, R.8, PR65 Red PCGS. The regular issue design for the 1867 Liberty Head quarter eagle. Struck in copper with a reeded edge. This is another so-called "trials piece, which was actually produced solely as an addition to the Mint's rare coin inventory for sale to collectors. 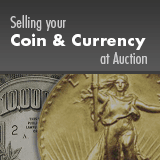 The Mint was the only "coin dealer" that could actually manufacture their own inventory. This is a stunning full red example. Both sides display deep cherry-red mint luster and brightly reflective fields. The strike definition is complete across both sides.